Tough ballistic nylon with wide mouth for easy access, padded sides and bottom. 6 outside pockets and 15 inside pockets; zipper closure. 8" wide x 13" long x 8-1/2" tall. Tools not included. 4 pockets on front, 3 pockets on back and 3 inner pockets. Size: 12" x 7". Made of heavy-duty Duckwear canvas to absorb tool oil. 11 assorted pockets. Fits 6 mm to 32 mm wrench sets. Opened: 18 in. W x 17.5 in. H.
12" standard Big Mouth? opens wide for easy access to bags contents. 8 multi-use pockets inside and 6 outside organize tools and accessories. Padded reinforced web carrying handles. 12"L x 8-1/2"W x 8"H. Made of single wall 600 poly ripstop fabric. Super-wide "Dr.'s Bag" opening. Heavy-duty Duckwear canvas to absorb tool oil. 25 pockets; 17 loops. Carry handle. Quick release buckle to secure when rolled. Size when rolled: 4 in. D x 14.5 in L. Size when opened: 26 in. W x 14.5 in. H.
Poly ripstop/600D poly material. Super-wide in. Dr's bag opening. 16 pockets: 6 exterior, 10 interior. Padded ripstop bottom. Side pull handles. 16" large Big Mouth? opens wide for easy access to bags contents. 12 multi-use pockets inside and 10 outside organize tools and accessories. Padded reinforced web carrying handles, adjustable shoulder straps. 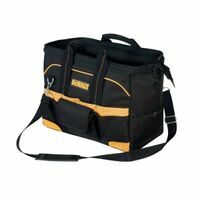 16"L x 8-1/2"W x 10"H. The 12" pop-open design allows for easy access to tools and parts and is made of heavy-duty poly fabric; includes base pads to protect bottom and an adjustable shoulder strap. There are 9-interior pockets including one-zippered pocket for security, 20-exterior with one flap-covered pocket with hook and loop closure. Custom Leathercraft Tool Bag, Heavy Duty, Series: Tradesman, 16 in Length, Hook and Loop Closure, Poly Fabric, Black, 33 Pockets, Padded Web Handle 9 pockets outside and 8 inside to organize a wide range of tools and accessories. Main pocket with web loops to accommodate large handle tools. 13-1/2" x 9" Multi-compartment plastic tray included, stores into middle compartment for easy access to the rest of bag contents. Padded carrying handles and adjustable shoulder strap. Metal tool snap and electrical tape strap. 16"L x 9"W x 9"H. Double wall 600 poly ripstop fabric. Super-wide "Dr.'s Bag" opening. Removable padded shoulder strap. 10 Pockets inside and 13 pockets outside to organize tools and accessories. 10" x 3" Multi-compartment plastic tray to organize small parts, recessed on top for easy access. Reinforced web carrying handles and adjustable shoulder strap. Overall dimensions: 16"L x 8"W x 11"H. Reinforced interior bottom panel and heavy duty stitching and bar tacking at stress points. 18" 'MegaMouth' opens wide for easy access. 12 multi-use pockets inside and 13 outside organize tools and accessories. Internal metal frame holds bag open, large interior to carry power tools, circular saws and hard hats. Padded handles and adjustable shoulder strap. 18"L x 11"W x 12"H. 21 Multi-use pockets to organize a wide range of tools and accessories. Adjustable, padded shoulder strap with metal hardware. Sturdy metal handle bar with foam grip for easy carrying. Wide open space below handle for easy access to tool carrier's main compartment. 14"L x 11"W x 11"H .
Specifically designed to be durable enough to withstand tough jobsite conditions. The cooler utilizes double insulation and a food-grade leak proof liner to keep ice cold for 24 hours without leaking. Additionally, Milwaukee constructed the cooler with 1680D ballistic material base and heavy duty metal zippers for a longer life. A tape measure clip with a bottle opener provides ultimate versatility. Lastly, Milwaukee implemented a tech pocket and dry storage compartment to make this cooler a versatile jobsite storage solution. Built-in LED light can be easily directed at work area or into tool bag to help identify tools and parts; 3 levels of light output allow adjustment for wide area illumination or close-up work; 11 multi-use pockets inside and 18 outside to help you better organize your tools; padded web carrying handles and adjustable shoulder strap; base pad feet to help reduce wear and abrasion; powered by (2) AAA batteries, included. 1680 heavy-duty poly fabric. Molded, waterproof bottom. Removable padded shoulder strap. StayPut? handle grips. 1680 heavy-duty poly fabric. Open tote with diamond PVC reinforced bottom. Includes plastic small parts tray. Removable padded shoulder strap. 14 pockets inside and 23 pockets outside to organize tools and accessories; 13-1/2" x 3" multi-compartment plastic tray to organize small parts on top for easy access; padded web carrying handles and adjustable shoulder strap; abrasion resistant rubber feet; large zippered outside pocket and heavy-duty tape clip. 18"L x 11"W x 11"H. Removable metal frame partition slides into place to customize tool box to your storage needs. Wide open space below handle for easy access to tool carrier's main compartment. Sturdy metal handle bar with molded foam grip for easy carrying. Multi-use pockets to organize a wide range of tools and accessories. Adjustable, padded shoulder strap with metal hardware. 20"L x 11"H x 11"D.
The 16" large open-mouth bag has 14 interior pockets, small parts bin, padded shoulder strap and reflective material; has reinforced water-resistant bottom. Use your DeWalt 20V MAX Lithium ion battery and our internal custom design battery dock as a USB charging source. Battery not included. USB charging battery dock simultaneously charge 2 devices via USB ports; 3 internal charging wall pockets fit tablet, phone and/or camera; low battery cut-off protection monitors battery voltage to avoid battery charge over-depletion; 20 multi-use pockets and 3 outside help organize a wide variety of hand tools. The 18" pop-open design allows for easy access to tools and parts and is made of heavy duty poly fabric, includes base pads to protect bottom and an adjustable shoulder strap. There are 26 exterior pockets including 2 flap-covered pockets, 14 interior pockets including one zippered pocket to secure valuables, utility knife pocket, measuring tape clip, easy double pull and heavy duty zipper. 1680 heavy-duty poly fabric. Molded, waterproof bottom. Removable padded shoulder strap. StayPut? handle grips. Side pull handles. Waterproof zipper. ID window. 43 Pockets inside and 7 pockets outside to organize tools and accessories. Large center compartment to carry multiple power tools and accessories and separate outside two compartments. Zippered side panels prevent spillage of tools when carrying or storing carrier. Vertical tool pockets keep them in sight for quick access. 18"L x 7"W x 14"H. 1680 heavy-duty poly fabric. Gatemouth "Dr.'s bag" opening. Diamond PVC reinforced bottom. Removable padded shoulder strap. The Low-Profile backpack is durable with a low profile design. The backpack is constructed of 1680D ballistic material and rugged metal zippers providing unmatched durability for a longer life. With 22 pockets including a padded electronic sleeve, the backpack provides ultimate organization. The padded and breathable load-bearing harness evenly distributes the weight for unsurpassed comfort and jobsite performance with 2x more padding than competitive units. Features 35 pockets for organizing tools; impact resistant molded base protects and allows backpack to stand up; 1680 ballistic material; load-bearing harness - padded and breathable for all day comfort; laptop sleeve holds laptops up to 15.6"; bulk pocket - quick access to bulks items such as fish tapes and power tools; attachment strap - allows bag to be easily and securely attached to vertical handles. 1680 heavy-duty poly fabric. Tech compartment in back fits up to 13 in. laptop. Tablet compartment in front. Dual handles allow handling as a work station. Adjustable sling strap works on either shoulder.